Django Unchained, like all of his previous work, is driven by the wit and rambunctious character of a formidably constructed script. I can’t think of a writer/director who is able to keep us engaged, no matter how lengthy his films get to be, with a simple well-timed sentence. Together with his unique in-your-face style of film making, Tarantino is a master of the spoken word, showing a remarkable capacity to adapt his writing and casting choices to the historic and geographical boundaries of his films. For this reason, the director is often compelled to choose actors that have made a living on the power of their speech alone (see Samuel L. Jackson). In Django Unchained, Christoph Waltz breezes through yet another Tarantino film as if he’s been a part of Hollywood since times immemorial. In their two collaborations, Tarantino and Waltz have created memorable characters whose effect on the history of cinema, in all likelihood, will outlive them both. What is truly remarkable is that just a year prior to the release of Inglorious Basterds, Christoph Waltz was stuck doing soap operas in Germany until a miraculous casting call made him abandon the comfort of a forgettable career. After his excellent Academy Award winning performance in Basterds, Christoph Waltz now plays Dr. King Schultz, an extremely unconventional bounty hunter traveling the American South just before the Civil War. He hunts for ellusive bounties as if it was all a game. Not only is he skilled while handling a weapon, but he is also a charismatic and clever man who is able to get out alive from seemingly impossible situations. In typical Tarantino fashion, Django is an ode to the history of cinema, borrowing elements from Spaghetti Westerns and several other genres. The emotional driving force of the film is revenge, one of the most powerful of human emotions. Those familiar with the director’s work know that this is a subject he typically explores. From Reservoir Dogs to Inglorious Basterds, there always seems to be a touch of revenge driving his stories and characters forward. As it is also common in Tarantino films, there are particulars within the story that wrap themselves nicely as part of a tightly-knit creative process that must take months, if not years to create. There is, for instance, Broomhilda (Kerry Washington), the German-born slave whom Django was married to and so abruptly separated from. Her name, so carefully selected by Tarantino, is the perfect literary tool from which Tarantino kicks off a journey in which the German bounty hunter has no other option but to assist Django in his quest to save his wife and “kill a few white men”. 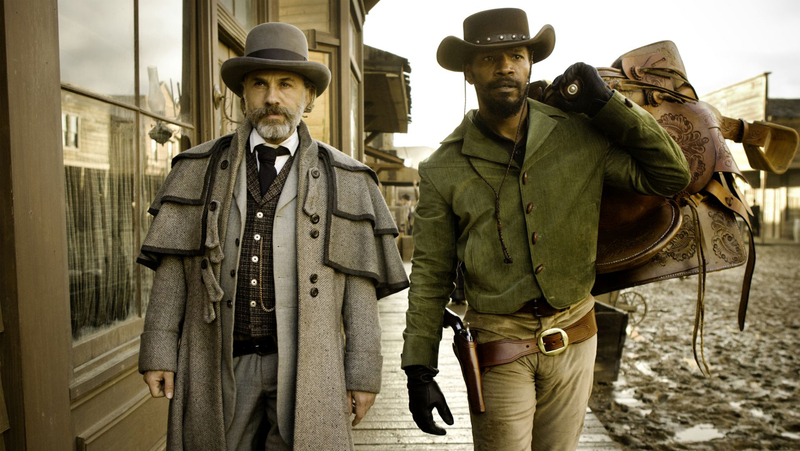 Due to its strong language and controversial subject matter, Django Unchained has already gained quite a controversial reputation. Spike Lee, for example, publicly criticized it for its loose and grotesque representation of slavery and the excessive use of the n-word. While the movie is indeed defined by excess, almost all of it serves the film well. How believable would the film be if the derogatory n-word was not used in 1858? Instead of controversial, Django Unchained is a powerful and sobering reminder of the abuses and atrocities that were committed against a race in a systematic and inhumane fashion. Besides Christoph Waltz who is absolutely fantastic, the rest of the cast at Tarantino’s disposal is equally great. Jamie Foxx in the title role is a mixture of bitterness and foolery that makes him such a comedic and exciting hero type. Leonardo DiCaprio carries the difficult role of Calvin Candie with the calyber of a great and versatile actor at the top of his game. He has rarely been more fun to watch than here. The same thing goes for Samuel L. Jackson who proves that his partnership with Tarantino is the stuff of legend. It is his performance, alongside that of Waltz, that truly made the film great for me. Not only is he incredibly funny, but with a layer of creepy and evil that makes this character memorable. After two great hours of film, Django Unchained unfortunately fizzles in favor of a last act that seems a bit unnecessary. Sure, the ending is cool and satisfying in a redeeming and heroic kind of way, but there is a sense that the violence eventually became gratuitous. In all likelihood, Tarantino fell in love with his heroes as he was writing them, and so he found a way to wrap up their stories in an epic and borderline cartoonish manner that seems to be more fitting in a lesser action/thriller film. Rating: 4/5 (great) – the best film of the year until the 2-hr mark. Christoph Waltz is a gift to us all. Excellent review. Django’s probably one of the most enjoyable Tarantino films I’ve seen. Probably the most entertaining film I’ve seen this month. Found that it was very Tarantino, but a bit more accessible. You could say more popcorn friendly, but that feels like I’m demeaning the film. Which I’m not. The last shootout reminded me a lot of the Crazy 88s scene from Kill Bill. I just figured, this is QT, it wouldn’t have a Tarantino film without something over the top ridiculous like that. The ending is definitely Tarantino, but I just wish the story had ended in a less witty and epic note that was more in tune with the rest of the film. It’s exactly the type of flick you’d expect from Tarantino: slick, violent, funny, tense, full of homages, and overall, cool. That’s all you really need and want with a Tarantino flick and that’s why I was glad this flick delivered on all of those elements. Good review. There are elements in here that didn’t seem to fit the overall flow of the film, and these all seemed to be jammed together at the end. 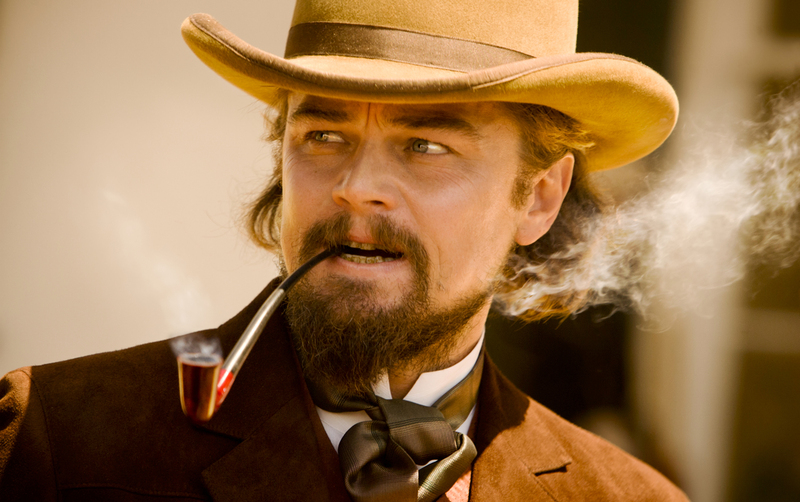 This is not to say I’m disappointed in any way, Django was very entertaining, I just wish it had ended differently. Great review, Niels. I get what you’re saying about the false ending, but I was just happy to spend more time with the film. I think Tarantino can get away with having more “fat” in his films simply because they don’t come around very often. Also enjoyed your final line about Christoph Waltz. I would love to see these guys collaborate again. Thanks Eric. Tarantino gets more leeway from me too. He never disappoints. I like your thoughts on Django. Christoph Waltz is like rare diamond that flourished in Inglorious Basterds. For me that is the best movie in Tarantino’s filmography. Django was great up to the point when our favorite bounty hunter died. But in many ways it stays great – it was funny, witty, colorful. I couldn’t agree more. Django was absolutely great until the bounty hunter dies. Thanks for stopping by my blog. This is indeed a great review Niels! I’ll be renting this for sure, not keen on seeing it on the big screen because of the violent content. It’s crazy that Christoph Waltz was stuck doing soap operas in Germany before he finally made his way to Hollywood. He’s an astounding actor! Oh yes, it’s pretty violent although not as much as other films that get released every year. It’s more controversial for its language. I look forward to your review of the film when it comes out on video. I take it that you are an avid fan of Tarantino? Great review! I haven’t watch much of his films, but Pulp Fiction. Though excellently executed and well-written script, the violence often turned me off. Quite a blood bath to me. But I loved the music, the comedy and the attitude of the two lead.